Potatoes sliced very thin that are deep-fat fried, which are also known as potato chips. Saratoga Chips come in many different types that include seasoned flavors, numerous shapes and a variety of textures. In addition, Saratoga Chips are also available in low-fat and low-sodium content versions. 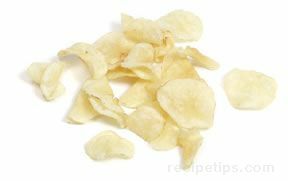 These chips are typically eaten as a snack or an accompaniment to meals with a sandwich or soup.